The conventional chemistry for linking building blocks into 2-D COF sheets or 3-D COF frameworks is reversible. This reversibility makes the connections within COFs weak and unstable in some chemical environments, limiting the practical applications of these COF materials. This one simple chemical approach targets a chemical reaction to the area of these weak links, forming resilient bonds that were shown to hold up—like a strong weld—to harsh chemical environments during experiments. The chemical transformation, he noted, makes the bonds between COFs more useful by changing their electronic and optical (light-based) properties, for example. "They can transfer electrons more easily after the reaction," he said, so that 2-D layers of these strongly bound COFs behave more like graphene, another exotic 2-D material that exhibits special electronic and optical properties. COFs have been heavily studied because they are highly tunable and can be composed entirely of light elements like carbon, hydrogen, nitrogen, and oxygen—unlike structures known as MOFs (metal-organic frameworks) that contain heavier elements. Scientists can make COFs with different pore sizes that can impact their function, changing what can pass through them or what can be contained within these pores. 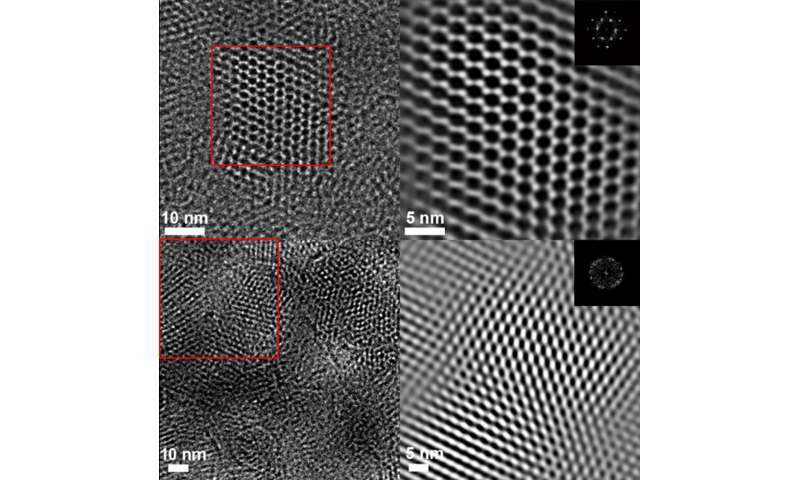 The researchers said the images obtained, which clearly show the honeycomb-like lattice of 2-D COFs, are among the best images yet of COFs, confirming the chemical changes in the COFs down to a fraction of a nanometer (a nanometer is 1 billionth of a meter).